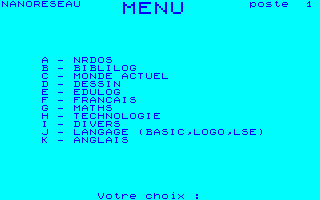 Moreover, the emulator is able to simulate a connection to a Nanoréseau file server, so that programs designed for the LÉANORD Nanoréseau may be run as-is with Emul5. About one hundred various programs have been tested and about 96% of them have run perfectly under Emul5. A rich-featured command prompt allows many operations on the MO5: tapes and MEMO5 images management as well as memory editing and disassembling, step-by-step execution with breakpoints and powerful manipulation of memory blocks: moving, searching, merging, and so on. You can reuse your old programs: about ten tools are provided to ease the manipulation and conversion of real MO5 data. 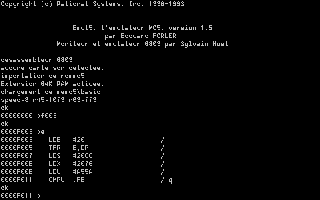 Emul5 runs on any 386DX with 2 MB of RAM and 1 MB free on the hard disk. But a 486DX2-50MHz is at least required to make it run at the original MO5 speed under MS-DOS. Under Win95/98/NT and Linux, Emul5 requires a Pentium 75 MHz to run smoothly. Any computer running Windows 2000/XP is powerful enough to emulate a MO5 at full speed.